Welcome to our highly valuable workshop specifically designed to assist defence companies better respond to requests for tender (RFT) and develop business-winning proposals in the defence sector. This workshop applies best-practice methods and frameworks, which can be adapted to suit small or highly complex defence tenders. 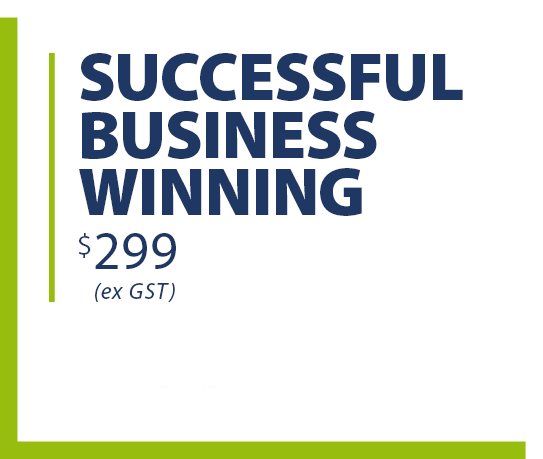 Based on years of experience, our Successful Business Winning Workshop will breakdown and simplify the business winning processes and provide tested and dedicated approaches to improve your company's overall success rate. Ultimately, it will equip you with the necessary knowledge and tools to dramatically enhance your proposal/ tender management, writing skills and overall "business winning" capability. or phone: 1300 940 967 so our team can more easily assist you with this booking process. *The published rate does not include GST. Total amount (plus GST) shows upon payment checkout.